I should have reposted about that sale here or in the other topic. I found out about it in the Sale Club of MFC. I do tend to prefer 1999 over Amiami because 1999 has the shipping calculation ready. You don't have to order and wait for price confirmation. Unless Amiami changed that when they upgraded their site. Anyway, I didn't see anything in the sale for me. Figures that are old are already sold out on their site. I want vintage anime and videogame figures! JetJockey (Il y a 2 mois) #50454681I should have reposted about that sale here or in the other topic. I found out about it in the Sale Club of MFC. I got the email earlier in the day about the sale then promptly forgot about it and it had been going on for a few hours when I looked, but that figure was still available and was the only one I wanted of what they had. Usually they either have nothing I want, or if they do it's something I already bought, and sometimes things sell out in a very short period too and I'm awful about missing the start of the sales since I always get confused about Japan time. You're probably right about the shipping calculations. I'm not sure as I haven't ordered anything from Amiami that wasn't a preorder in a long time. Amiami's preorder prices are usually slightly cheaper; when they aren't or if I end up waiting and they've raised theirs, I tend to order from 1999 because I can get unregistered SAL from them. It saves a little bit and I've never had a package lost, and I get them quite a bit faster...I guess the registered ones sit around waiting to be scanned sometimes or something. Both shops have good service and pack very well. 1999 doesn't have the cute postcards though which is a small minus. I think 1999 tends to sell out of stuff faster or not get as much stock as Amiami. Also Amiami seems to get restocked on items more than 1999. This year I'm going to wait and watch when and if Japanese figures show up at BBTS and Amazon. As sometimes they do and we get can get some discounts. Deluxe Hot Toys Captain Marvel. Probably won't sell out but still I'll keep an eye on her just in case. Sideshow has that wait list too. But I'll want the deluxe version which I think might be the first deluxe packaging for a female Hot Toys character. And the movie will be popular. Looks like Captain Marvel has molded hair instead of the fiber doll hair that is on a lot of the female Hot Toys? I have Beatless Lacia's rerelease ITEM #61394 for this month if she isn't delayed. I have something at the post office I haven't had time to go pick up yet which is possibly the Izetta figure from the 1999 sale. Seems like Mythra has a date now, so I'll be getting her this month, along with some nendoroids that TOM finally shipped out. That'll probably be it for a while, until whenever that KOS-MOS figure goes up for preorder. 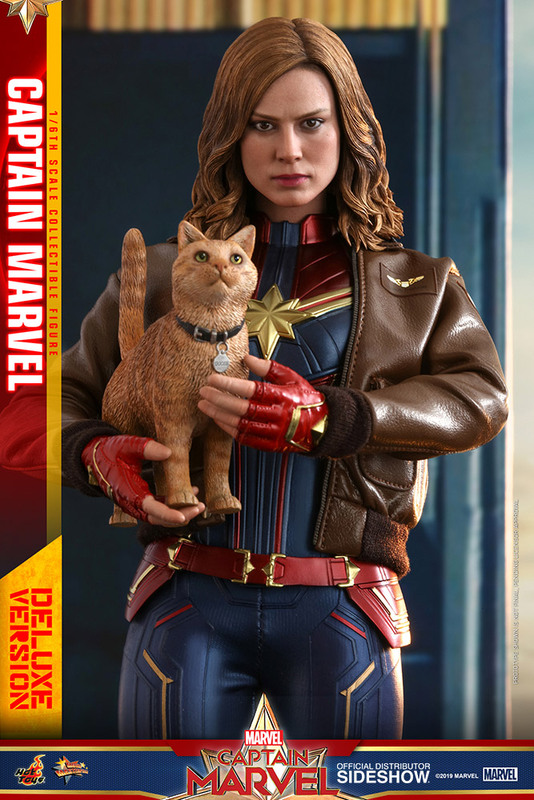 cfx (Il y a 1 mois) #52991719Looks like Captain Marvel has molded hair instead of the fiber doll hair that is on a lot of the female Hot Toys? Princess Leia and a few others have the molded hair. I'm waiting for the Endor Leia and hope she is a deluxe version like Endor Luke. No pre-orders. I'm still watching for that Sideshow Collectibles Queen release but she was delayed to April now. I got the Izetta figure ITEM #549422 yesterday. The box is huge and seemingly larger than needed as the rifle comes in two parts. She's listed as 1/7 and since she's kneeling it's hard to judge but as large as her head is I think she's more like 1/6. Very nice figure and worth it to me at the sale price I got her for. Here are some images of her that I took, I had issues trying to be creative, although Miku is very elegant and gorgeous, she is simple and that... is that. Hope you all have been and continue to be well =). GSC has announced Lacia is delayed until June, so there goes my preorder for the month. I did recently receive from Mandarake the warp color Yuki Mori ITEM #195189 which I've wanted for a while but her price used to be pretty high. All I had this month was a Misa Hayase model kit I was interested building/painting ITEM #676489 but it got delayed until next month. Kind of curious about these larger scale plastic model kits after painting a lot of 28mm miniatures. I think I'm gonna do something stupid like preorder Alter Velvet. GaijinDensetsu (Il y a 1 mois) #54684253All I had this month was a Misa Hayase model kit I was interested building/painting ITEM #676489 but it got delayed until next month. Kind of curious about these larger scale plastic model kits after painting a lot of 28mm miniatures. I need a good scale painted version of her from DYRL. I don't know why Arcadia's Minmay isn't showing up on MFC. george_us (Il y a 1 mois) #54828978I think I'm gonna do something stupid like preorder Alter Velvet. Yeah no. That's too goddamn much. JetJockey (Il y a 1 mois) #55093451I don't know why Arcadia's Minmay isn't showing up on MFC. Likely because anyone who knew about it didn't bother adding ^^. Have created a draft entry - ITEM #824050. Feel free to update the entry with any info I've missed. Not sure if the release is standard or exclusive, as I'm not familiar with Arcadia. [checking...] Oh, that Velvet. I thought there was a new Odin Sphere figure I didn't know about lol. cfx (Il y a 1 mois) #55282381[checking...] Oh, that Velvet. I thought there was a new Odin Sphere figure I didn't know about lol. Tsuyu ITEM #728446 got delayed to April so got nothing this month. finally got my notification that ITEM #464791 shipped from TOM for me. Have a space already all cleared out on the shelf for her. thought I would be more into this ITEM #549677 but meh. It has like everything I want in a figure but it doesn't do any of it particularly well. conversely, this isn't my type of figure but I love how it looks ITEM #806355. Freezasaurus (Il y a 1 mois) #55280256Yeah no. That's too goddamn much.